It’s only now I’m getting to write up something for the day so apologies for the delay. 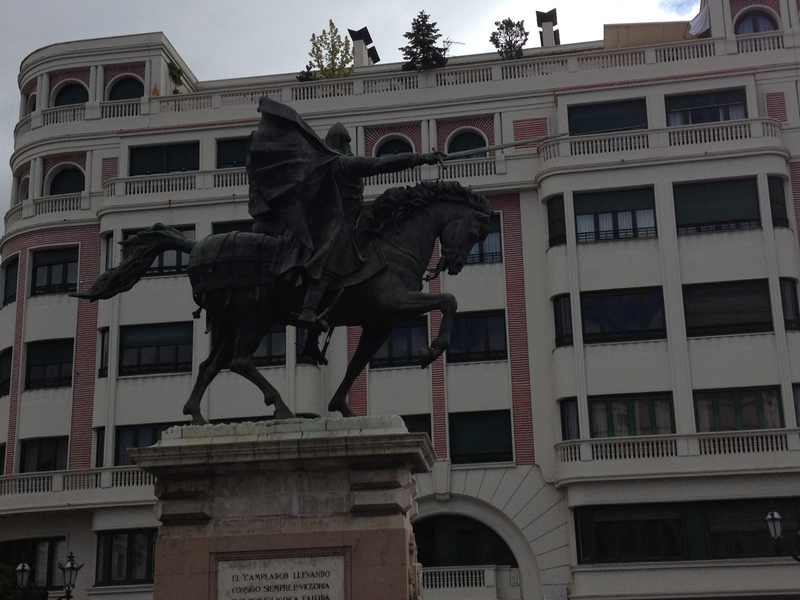 The severe lack of wifi is beginning to annoy me and I would have thought Burgos had some sort of access. Anyway, I move on. I leave Atapuerca this morning before 6. I didn’t enjoy my time there mainly because the Albergue was flooded with Irish folk. My decision to move from Ages to Atapuerca was a good one as the majority of people I know stayed there. One or two others stayed in Ages and San Juan and they would meet up with us all in the large city. Michel, Tanya, Franco and myself left before 6 to total darkness. Not a light in the air and no clear sky to guide us. So we used the light on my iPhone to lead us. There was a large hill to crest before we saw the lights of Burgos and it was a tough climb with little signage and light. Over the hill, the skies would light up thousands of flickers from industrial estates, trucks, and the airport. We were yet 15km from Burgos and I wished we could get it out of the way. Tanya and myself walked ahead and we soon lost sight of Franco and Michel. Tanya is from Quebec who uses English as her second language, but we had great fun talking about languages, Gaelic football and her Camino. She started from Lourdes a month ago so had a lot more experience than myself. Chatting like this made the hours go by and it wasn’t long before we saw the Cathedral standing tall. The Albergue is at the back of it. 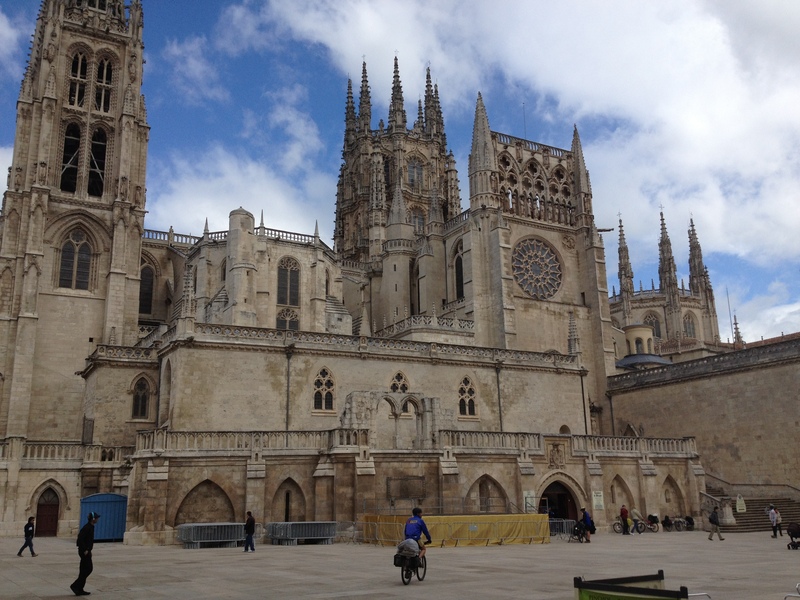 I have to say the walk into Burgos is one of the most mind numbing sections on the Camino. Most people get a bus through the industrial buildings, residential estates and smog. The walk was mostly on concrete and this hurt my feet. I feel a blister coming on and my lower back is aching. I don’t think this would happen on gravel or sand. That said, I was delighted to get at the Albergue at 10am…a whole two hours before opening. 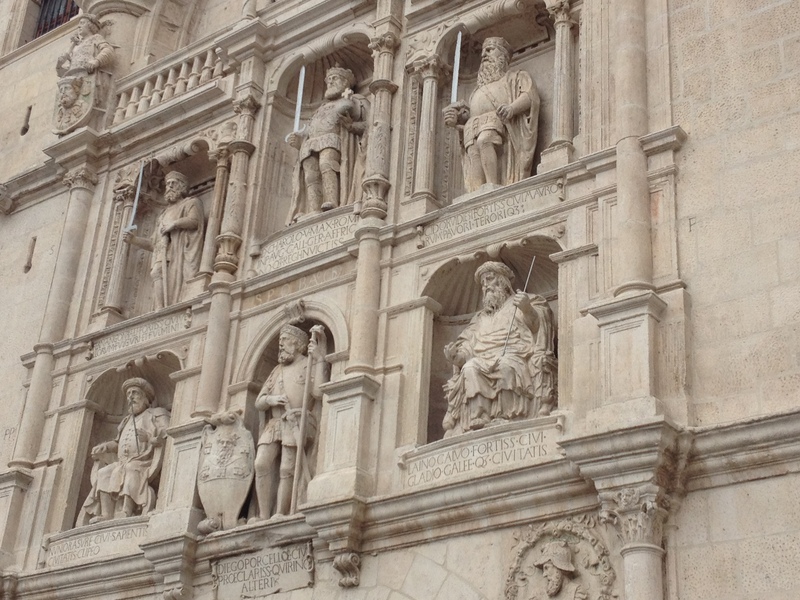 Do I go further or stay and see more of Burgos? I was quite happy to stay put for the night. I met all the Irish folks from over the last week. Jimmy and Christine finished up today and were heading back to Dublin in the morning. I also met Niall from Monkstown who I had been told about but not met him. He had a few injuries and was taking things slow. He was doing what I had wanted to do and stay in the smaller hostels along the way; Azofra, Granon, Tosantos..and tomorrow San Bol which has no electricity. He was a great laugh but I can’t see him meeting me again. I also met a WordPress follower who owns ‘Melanie’s life online’. 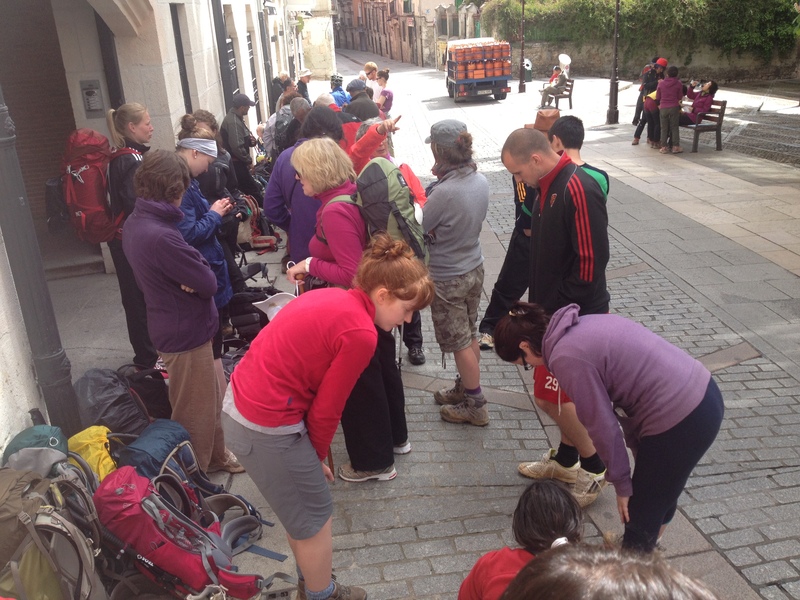 I knew she was on the Camino but has no idea I would meet her. I recognised her face and asked if she was who she was. It was great to meet a blog follower. Highlight of the day was meeting old friends from day 1 and 2. I’m up early again tomorrow and hopefully will reach Hontanas, a 31km trek through the start of the meseta. Let’s hope Wifi is available there but I seriously doubt it!